Come down and help out, as we dig, plant and chatter around the new jewel in Northcote’s crown. You are welcome to donate healthy seeds, cuttings and plants and to be part of the fun watching a dirt pit transform into the garden of Eden. 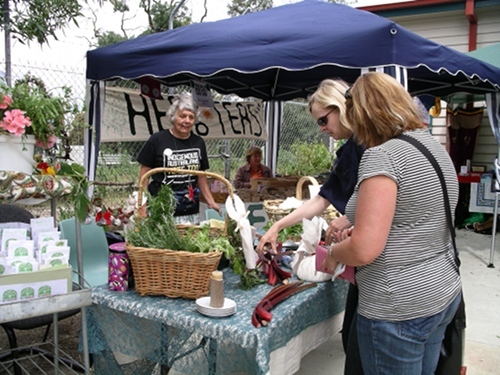 Check out the Northcote Library Food Garden Blog for up-to-date info. Been looking for a chance to offload those excess tomatoes and pick up some apples? The Melbourne Food and Wine Festival in conjunction with CERES Urban Orchard, Yarra Neighbourhood Orchard and Cultivating Community are holding “The World’s Biggest Eva Vegie Swap”. Annerliegh will be there trying to rally a li’l support for the northern produce share movement. If you’d like to come along and just hang with her….awesome. You can bring pretty much anything including fruit, veg, preserves, bottled delicacies etc. Be there or be pear. Early yesterday morning, a group of 12 adults and 6 children set off for a berry picking adventure. We went up the windy road to the lower hills of the Strzelecki ranges and found that the Sunny Creek Organic berry farm was a little cooler than the highway we had transcended from. The day started with a talk on the history and setting up of the permaculture designed property by one of the owners, Phil. 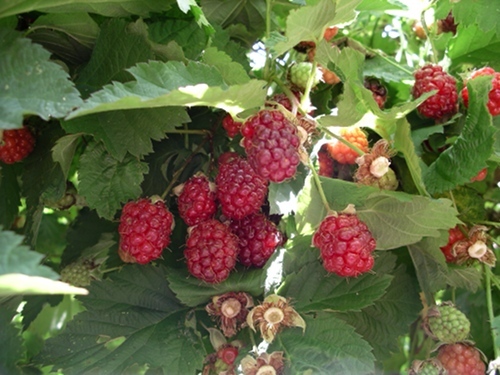 We learnt of the importance of frogs and bees to the organic berry farmer, why currants will grow under chestnut trees but raspberries won’t, and how to tell a golden raspberry plant from a red raspberry, even before it fruits. Most importantly for our purposes on the day, we learnt how to judge a berry for immediate eating versus one for keeping a few days or freezing. Then it was time to pick and be merry. 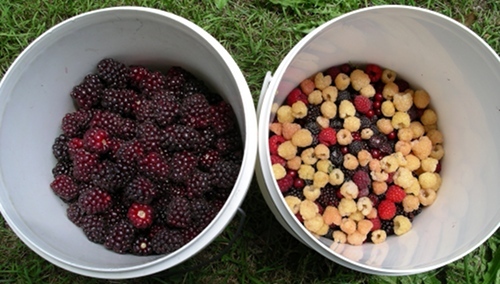 Everyone had a bucket to fill, and there were oodles of beautiful plump berries to be had – silvan berries, boysenberries, youngberries, blackberries (all types of brambles), a rainbow of raspberries (yellow, red, purple and black) some red currants and a smattering of blueberries. 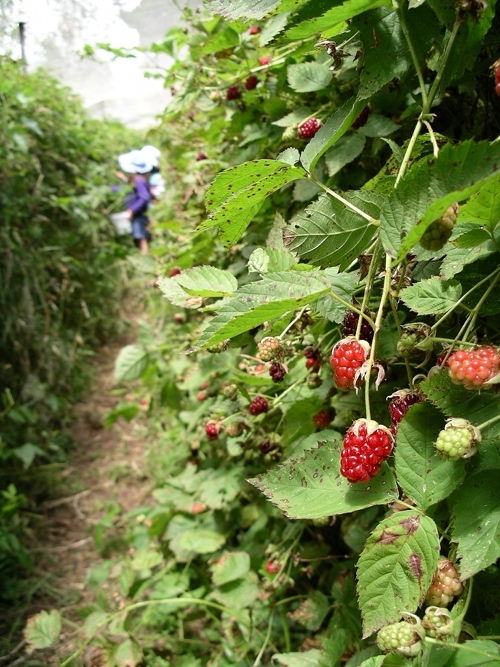 It was a perfect temperature for picking and we were in under the nets reaching for large clusters of berries, some so ripe that they fell off their stalk as soon as they were touched (then you had to ferret in the undergrowth to save them!). Of course a fair amount of berry grazing was done along the way, encouraged by the owner, who suggested we savour the sharper, more acidic, less ripe fruit and compare it with its more fully ripened and darker neighbour. The owners gave us a lovely spot to have morning tea and our picnic lunch, and the children had a lovely time seeking adventures in the nearby bush and looking for tree frogs in the pond. After weighing and packing our bounty, we wandered our separate ways home with our berry treasures, some stopping off in Yarragon on the way for a cuppa, and others checking out the new foal on a local farm, all determined to add one or two varieties of berry to our gardens next spring. Perhaps the apple season will take us for another venture up into the hills– cox’s orange pippins and Canadian cider apples await. We will keep you posted re picking season for the apple crop and highly recommend the quality of the berries and berry picking experience at Sunny Creek. Missed out? Wished you could’ve come too? Join our mailing list and next time you’ll know about it! Made ‘n Thornbury, an initiative of Thornbury Women’s Neighborhood House, held its final community market for 2010 on Saturday 11 December and Transition Darebin was among the stallholders, selling home-made produce, crafts and Christmas decorations and a selection of home-grown herbs, vegies, seeds and seedlings, all provided by Transition Darebinites. It was a fun day, not least because we got to check out the other stalls. There are some seriously creative craftswomen in Darebin. We also discovered that fresh rhubarb is in high demand so it’s a good thing this reliable perennial is growing in many of our gardens. The next Made ‘n Thornbury market will be in autumn. We hope to be there again. Thanks to the wonderful Maz, Rachel and Kelly for suggesting and organising our presence at this one. Transition Darebin hosted a forum on the future of food in Preston on the 23rd of October 2010 at Preston Shire Hall. After a welcome from Mayor Vince Fontana Michelle Darebin from the City of Darebin’s Environment team updated us on how people in Darebin are faring with food security and what the City of Darebin council is doing on food availability and sustainability. Guest speaker Kirsten Larsen from the Victorian Eco-Innovation Lab reported on what climate change and the end of cheap oil means for food in Australia. Over lunch participants met some of the groups in our area who are involved in exciting food-related projects before participating in an ‘Open Space’ session to explore the question: how will Preston feed itself over the next twenty years? Participants gather for the open space session. Here is a summary of what participants talked about during this session (PDF, 56KB). Transition Darebin thanks the City of Darebin for supporting this event. On Saturday 9th of October more than 30 people came on on a tour of local food sites, taking in community gardens, productive backyards, Preston Market and a talk on Preston’s rich food producing history, as publicised in the Preston Leader a couple of weeks ago. We met at Sprout, a community garden next to Thornbury station that helps people experiencing homelessness and mental illness get some hands-on skills. The garden plots are communal rather than private, and the garden throws open its gates to the wider community with a market on the first Thursday of the month. Transition Darebin’s very own Kat Lavers opened our eyes to the useful weeds growing all around us on our way to Angelo’s house. Angelo’s house has an amazingly productive permaculture bursting out of his backyard and he was only to happy to give away tips and even seedlings and cuttings to people inspired to start growing their own. At Costante Imports on Bell Street we found all kinds of food processing and preserving equipment – which is just what you need if you have a yard as abundant as Angelo’s! Then we grabbed lunch from Preston market and walked to a nearby park to listen to tales of Preston’s food-producing past from Merv Lia from the Preston Historical Society. You can download a scanned copy of Merv’s notes (PDF, 292 KB). Finally we had a well-deserved sit down at Motor Mower cafe on Murray Road where we heard about how a cafe can be set up in a low-impact way. See the map below or download the schedule (PDF, 60KB).